I’m betting for funny kooky. Do let us know which one it is when you meet him! Hastings Bierstube (HEY they have free internet Matt!) Your there on a good day! Yummy. Jalapeno & Cheddar Stuffed Shrimp for only $7.99!!! You have to come and try these! Summerfest Tent Party with live music from Kooky Uncle Tony. If you missed our Oktoberfest tent party you can make up for it by showing up to this one. We are kicking things off at 6pm. If he’s from Hastings, I’d say drunk Kooky so it could go either way. 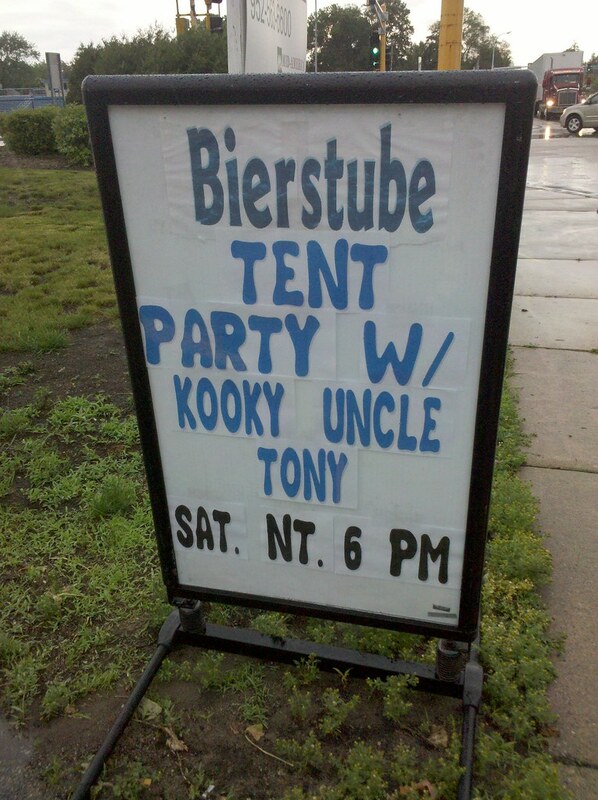 a saturday night tent party that starts at 6 with “uncle” tony… definitely creepy! Justin- Thanks for the laugh. I’m too old for LOL. My question is when is 6 PM ever not at NT.? I’m going with drunken kooky and funny, all at the same time. The music will be good, if you like oompa bands…. Funny, my cousin used to work at a Bierstube in Northern Thailand. German food and drunken germans…there’s a joke in there somewhere. Not sure of your exact plans, but the Minneapolis Marathon is being held this Sunday, June 6th starting and ending near the Guthrie Theatre in downtown Minneapolis. Quite a spectacle and lots of people around. I wonder, is if he’s related to Captain Crazy? I live just up the road from this sign…Matt I hope you got in out of the rain! Good food at the ‘Stube, but never got to see Kooky Uncle Tony. Probably just as well. Jeremy, thanks for the link…good interview! I bet my bottom dollar he will start off as creepy KOOKY, till the beer google effect kicks in.. then he transforms to KEWL KOOKY !!!!!!! I bet you will be 75 mile from there on Saturday…..Just walking…away from kooky Saw the rain in the photo’s! ahh and i was rooting for sunshine all the way..! woops…back to work I go. Don’t know much about MN except it’s pretty and cool. Went to Rochester once to the Mayo Clinic so can’t say much about Kooky Uncle Tony except KEEP ON WALKING. this is so much fun…. Not necessarily a bad band; it’s hard to get work these days and such an event would be a good way to stay in shape and troll for paying gigs. I’d do it (once) just to be able to add “tent party with uncle kooky” to my calendar! Patty, I’d love to have a T-Shirt with that Logo on it huh? I’m from Hastings and I have never hear of Uncle Tony. I think it is safe to assume he is as creepy as any Bierstube tent party probably is which is very creepy. Hey Matt, hope Minnesota is treating you well. Have a safe trip up and through the Cities! 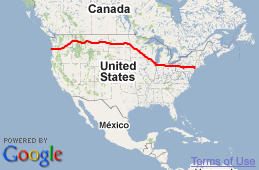 Walking from Washington to Flordia Keys! I am so serious you guys look kinda alike! You guys may pass one another one day!